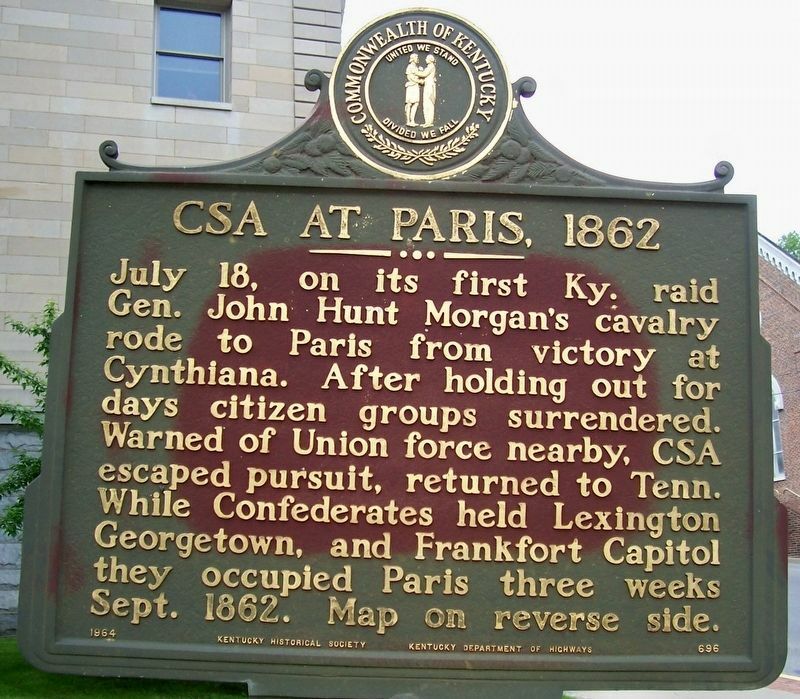 July 18, on its first Ky. raid Gen. John Hunt Morgan's cavalry rode to Paris from victory at Cynthiana. After holding out for days citizen groups surrendered. Warned of Union force nearby, CSA escaped pursuit, returned to Tenn. While Confederates held Lexington, Georgetown, and Frankfort Capitol they occupied Paris three weeks Sept. 1862. Map on reverse side. 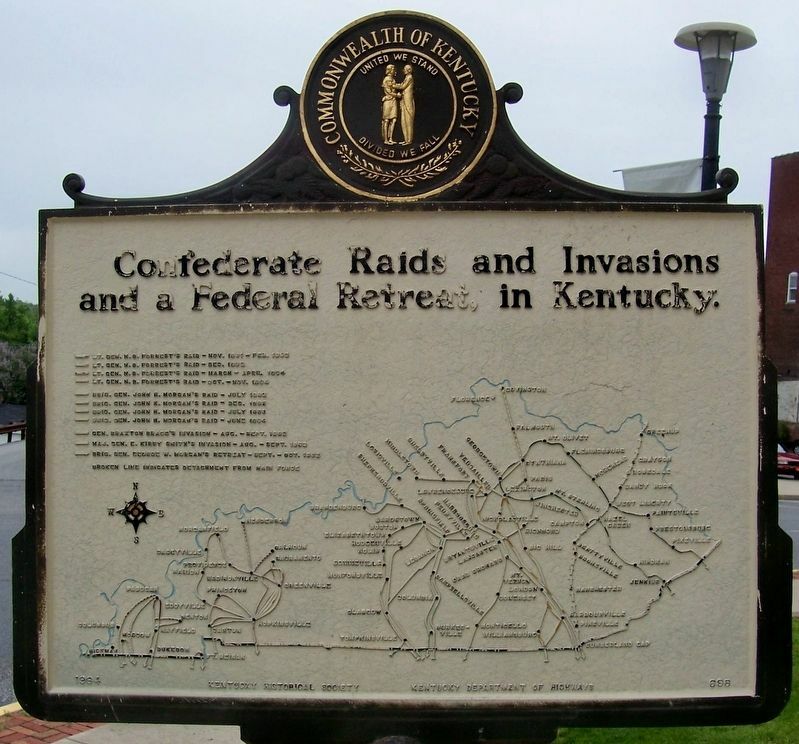 Confederate Raids and Invasions and a Federal Retreat in Kentucky. Location. 38° 12.808′ N, 84° 14.991′ W. Marker is in Paris, Kentucky, in Bourbon County. 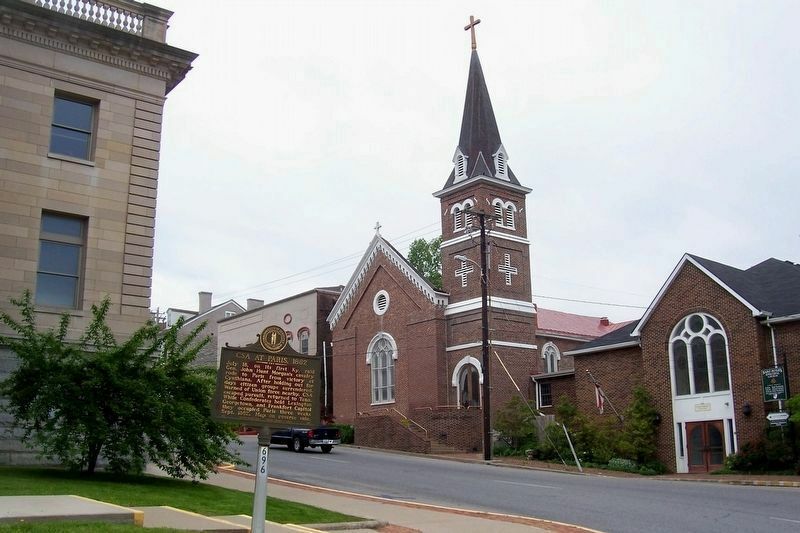 Marker is at the intersection of Bank Row Street (U.S. 460) and High Street (U.S. 460), on the left when traveling west on Bank Row Street. Touch for map. Marker in the northwest corner of the Bourbon County Courthouse square. Marker is in this post office area: Paris KY 40361, United States of America. Touch for directions. Other nearby markers. At least 8 other markers are within 5 miles of this marker, measured as the crow flies. John Edwards 1748-1837 / Westwood (within shouting distance of this marker); Duncan Tavern (within shouting distance of this marker); Bourbon County, 1786 (about 300 feet away, measured in a direct line); Bourbon County World War I Monument (about 300 feet away); William Holmes McGuffey (about 300 feet away); Eades Tavern (about 600 feet away); Cane Ridge Meeting House (approx. 4½ miles away); Bourbon Whiskey / Jacob Spears (approx. 5 miles away). Touch for a list and map of all markers in Paris. 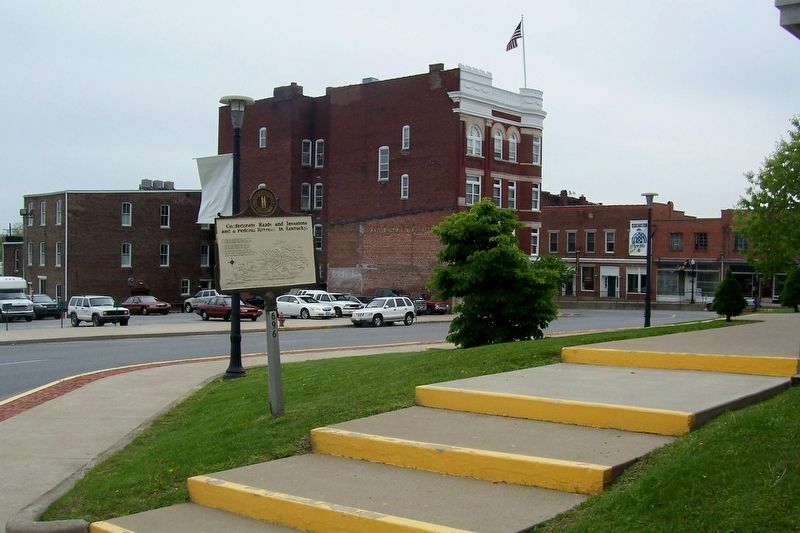 High Street is in the background and courthouse on the left. Bank Row Street is in the background. More. Search the internet for CSA at Paris, 1862. Credits. This page was last revised on August 23, 2016. This page originally submitted on August 23, 2016, by Forest McDermott of Masontown, Pennsylvania. This page has been viewed 217 times since then and 13 times this year. Photos: 1, 2, 3, 4. submitted on August 23, 2016, by Forest McDermott of Masontown, Pennsylvania. • Bernard Fisher was the editor who published this page.